From a Chinese rover on the moon and new spacecraft orbiting Mars, to private spaceships and the most powerful digital camera ever built, space will be practically buzzing with human activities in 2014. Both India's Mars orbiter Mangalyaan and NASA's MAVEN mission are expected to get into their orbits around Mars in September. MAVEN is going to investigate the Martian atmosphere and hopefully help piece together the history of how the Red Planet lost its atmosphere. Mangalyaan, India's first Mars probe, is designed to beam back images of Mars' surface and hunt for methane in the planet's atmosphere. China became the third country to make a soft landing on the moon with their Chang'e 3 lander at the end of 2013, so its science operations should start gearing up in 2014. The Yutu (Jade Rabbit) rover deployed by the lander will use a robotic arm to collect lunar dust samples for analysis, and it will beam back photos of the moon's surface to Earth. China's lunar rover Yutu ("Jade Rabbit") is seen by a camera on the country's Chang'e 3 lander after both successfully landed on the moon together on Dec. 14, 2013. It is China's first lunar rover mission and the first soft-landing on the moon in 37 years. A NASA spacecraft set to continue its mission into 2014 was already orbiting the moon as Chang'e 3 touched down. The Lunar Atmosphere and Dust Environment Explorer mission (LADEE for short) is tasked with investigating the moon's extremely thin atmosphere and probing the dust environment of the natural satellite. It will continue its science operations into 2014. Other probes like the Lunar Reconnaissance Orbiteand the twin Artemis probes are still circling the moon and sending back data to Earth as well. Gaia will make the largest, most precise 3D map of our galaxy by surveying an unprecedented number of stars. The recently launched might change the way scientists look at the universe. The European Space Agency probe is tasked with creating the most precise 3D map of the Milky Way ever produced. The twin telescopes on the spacecraft are expected to map 1 billion stars in the galaxy and even map smaller objects like alien planets circling those stars. The $1 billion mission will enter into its five year science mission after a four month commissioning phase. Launched in 2004, the Rosetta probe will catch up with its target comet at long last in August 2014. The European Space Agency's comet interceptor Rosetta is expected to catch up to comet 67-P/Churyumov-Gerasimenko just as it sails inside the orbit of Jupiter next year. 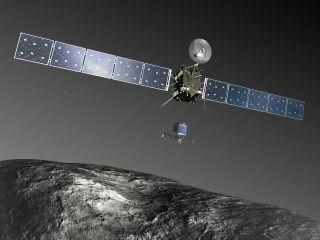 Scientists are planning to awaken Rosetta from its deep hibernation on Jan. 20, 2014 to prepare it for the next phase of its $1.4 billion mission. When the probe is less than 1.2 million miles (2 million kilometers) away from the comet, it will start to snap more detailed photos of the comet, gathering more information for the spacecraft's eventual rendezvous. In November 2014, the probe is scheduled to deploy the Philae lander to the surface of the comet. The lander is expected to beam back unprecedented views from its position on the 2.4-mile in diameter (4 km) comet. The year 2014 promises to be a great one for private spaceflight. In the first week of the year, two commercial companies hope to launch private rockets, and more missions will follow as the year goes on. On Jan. 3, the Hawthorne, Calif.-based company SpaceX will launch its first mission of the year using its upgraded Falcon 9 rocket. The flight will launch from Cape Canaveral Air Force Station in Florida and carry the Thaicom 6 commercial satellite into orbit, but that is just for starters. SpaceX also has a $1.6 billion deal with NASA for 12 unmanned cargo delivery missions to the International Space Station using the Falcon 9 rocket and its unmanned Dragon capsules. The third mission in that series is also due to launch this year, possibly in February. One week into the year, on Jan. 7, the commercial company Orbital Sciences Corp. of Dulles, Va., is due to launch its first official cargo mission to the space station using its own Antares rocket and robotic Cygnus spacecraft. In 2013, Orbital Sciences launched an Antares test flight as well as a Cygnus demonstration mission, but the upcoming launch will be the first delivery flight of its $1.9 billion cargo contract for NASA. And then there are the space tourism companies. Virgin Galactic made huge strides in 2013 with supersonic rocket-powered test flights of its commercial SpaceShipTwo spacecraft, which promises to fly passengers on suborbital spaceflights for $250,000 a ticket. The company is expected to build on that success in 2014, potentially with its first flights into space. Several other companies, such as XCOR Aerospace, Sierra Nevada Corp., Blue Origin and Boeing, are developing commercial spacecraft for various uses, and should also make more progress in 2014. 2014 might just be the year of Orion. NASA is planning on launching a test flight of their Orion spacecraft — a new crew-carrying capsule expected to bring astronauts to Mars and other deep space destinations — in September 2014. For the test flight, Orion will plunge through the atmosphere so that engineers can assess the capsule's heat shield. Orion is also expected to make a parachute-aided splashdown in the Pacific Ocean. This unpiloted test flight will be launched atop a Delta IV Heavy rocket from Florida's Cape Canaveral Air Force Station. Eventually, the capsule will be boosted into space by NASA's Space Launch System rocket, a heavy-lifting booster in development now. The International Space Station will play host to five crews through the course of 2014. The Expedition 38 crew currently staffs the $100 billion orbiting outpost, with Expedition 39 launching in March. Expeditions 40 through 42 are also scheduled to live aboard the station before the year is finished. Two commercial spaceflight firms will also launch robotic resupply missions to the station under contracts with NASA. SpaceX is expected to launch their unmanned Dragon capsule to the station. Orbital Sciences Corporation is slated to launch its first official cargo mission with the Cygnus spacecraft after successfully completing a test run in 2013.